HI. MY NAME IS ___________ AND I’M A RADIO CITY MUSIC HALL ROCKETTE. I’M ORIGINALLY FROM _________ AND I’M HAPPY TO WELCOME YOU TO RADIO CITY. THE REHEARSAL HALL YOU PASSED ON THE WAY OVER IS ALMOST THE EXACT SIZE OF THE STAGE AND IS MARKED TO INDICATE THE STAGE ELEVATORS, POSITIONS OF THE PROPS USED DURING A PARTICULAR SHOW AND THE POSITIONS FOR THE DANCERS. YOU MAY HAVE NOTICED THAT THE BAR AGAINST THE MIRROR IS A FEW INCHES HIGHER THAN THE AVERAGE DANCE BAR. THE REASON FOR THIS IS THE ROCKETTES MUST STRETCH THEIR LEGS AS MUCH AS POSSIBLE IN ORDER TO MASTER OUR FAMOUS EYE-HIGH KICKS. IF YOU’VE EVER SEEN THE ROCKETTES PERFORM, YOU’VE SEEN THAT WE ALL APPEAR TO BE THE SAME HEIGHT. THIS ILLUSION IS CREATED BY PLACING THE TALLEST GIRLS IN THE CENTER DESCENDING IN HEIGHT TO THE ENDS TO THE SHORTER GIRLS. 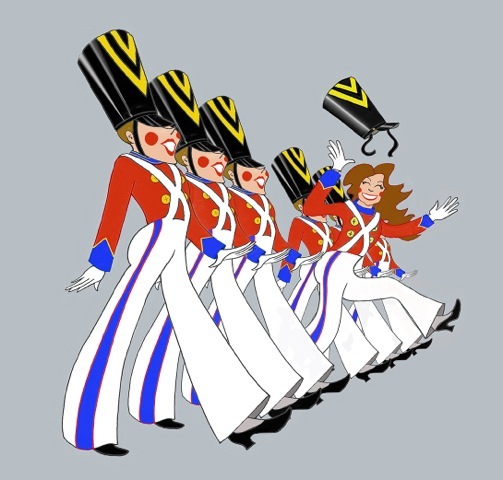 THE TALLEST GIRL CAN’T MEASURE MORE THAN 5’9” WHILE THE SMALLEST GIRL IS 5’5 ½” AND ALL THE ROCKETTE HOPEFULS ARE MEASURED DURING AUDITIONS ON THE OFFICIAL MEASURING STICK AGAINST THE DOOR. THE ROLE OF THE ROCKETTE IS EVER EXPANDING. NO LONGER DO WE DANCE SOLELY FOR MUSIC HALL AUDIENCES. OUR BUSY SCHEDULE NOW INCLUDES CONVENTIONS, SPORTING EVENTS, NATIONAL TOURS AND GLAMOUROUS APPEARANCES ON FILM AND TELEVISION. IN RECENT YEARS WE APPEARED WITH SUCH LUMINARIES AS ANN MARGARET, CHITA RIVERA AND SUSAN ANTON TO NAME A FEW. AS THE ROCKETTE ROLE HAS EXPANDED, SO HAS THE TROUPE—100 DANCERS ARE CURRENTLY ON STAFF, THUS ENABLING MANY LINES OF ROCKETTES TO PERFORM AT ANY GIVEN TIME. THE NUMBER OF ROCKETTES IN A LINE CAN VARY DEPENDING ON THE PRODUCTION AND THE SIZE OF THE STAGE. AS MANY AS 60 OF US APPREARED IN A RECENT DAVID LETTERMAN SHOW, WHILE AS FEW AS 12 ROCKETTES TAPPED WITH TOMMY TUNE IN A SPECIAL 1991 NEW YEAR’S EVE CELEBRATION AT THE RAINBOW ROOM. PEOPLE ALWAYS ASK ME WHAT IT’S LIKE TO BE A ROCKETTE AND MY ANSER IS ALWAYS THE SAME—IT’S GREAT!! THERE IS LITTLE THAT BRINGS AS MUCH JOY AS DANCING FOR AN AUDIENCE OF SMILING AND APPLAUDING PEOPLE.